American physician; born at Philadelphia Jan. 1, 1869; educated at the University of Pennsylvania (M.D. 1889). For more than a year he acted as intern at Blockley Hospital, and then entered the Marine Hospital Service. In 1892 he attended courses at Berlin and Vienna, and in 1893 was made, on account of a cholera epidemic in Europe, sanitary attaché to the United States consulates at Hamburg and Antwerp. Returning to the United States, he served as quarantine officer at the port of San Francisco from 1895 to 1898, and in 1899 established upon original lines quarantine regulations for the island of Cuba. In 1900 he was appointed director of the hygienic laboratory of the Marine Hospital Service at Washington, D. C., in which capacity he is still (1905) serving. 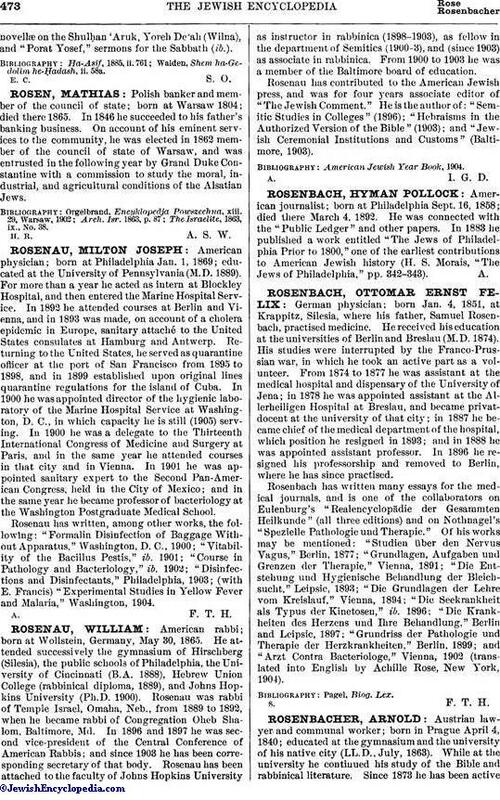 In 1900 he was a delegate to the Thirteenth International Congress of Medicine and Surgery at Paris, and in the same year he attended courses in that city and in Vienna. In 1901 he was appointed sanitary expert to the Second Pan-American Congress, held in the City of Mexico; and in the same year he became professor of bacteriology at the Washington Postgraduate Medical School. Rosenau has written, among other works, the following: "Formalin Disinfection of Baggage Without Apparatus," Washington, D. C., 1900; "Vitability of the Bacillus Pestis," ib. 1901; "Course in Pathology and Bacteriology," ib. 1902; "Disinfections and Disinfectants," Philadelphia, 1903; (with E. Francis) "Experimental Studies in Yellow Fever and Malaria," Washington, 1904.